India has a considerable shortage of blood in its blood banks, with more than 38,000 donations reportedly required every day to balance it. 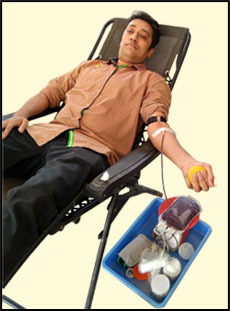 Blood banks along with social organisations are doing a great job by conducting regular blood drives. Yet there are many instances wherein there are no blood components available for emergency transfusion. Due to the shortage Blood banks, patients and their relatives either have to search blood donors for their requirements from their own networks, or reach out to the society by using social media or related tools. This is quite difficult and mainly time-consuming, both to find donors, or to donate blood to someone in need. Dr.Sheila Mundhada, Medical Director, JeevanJyoti Blood Bank Nagpur, has been continuously working on ways to reduce the donor recruitment time in case of emergency. "We have built a healthy voluntary blood donor pool over the last 5-6 years. We have reached out to social organizations, educational institutes and corporates for conducting blood drives. This helps us to maintain a ready stock of blood components for most part of the year. However there are frequent scenarios wherein the demand is high as compared to the blood component availability. This is the time when it is quite challenging to recruit donors urgently". Infact, quite a few blood banks are now maintaining inhouse telecalling team to call blood donors from their repository and check if they are available to donate blood for an emergency. But this is quite time consuming. "We have team of 5 executives dialing blood donors from different blood groups. In a day, the team is able to reach out to approx 350 donors in 6-8 hrs and 5-6 Donors turn up for donation by day end. Incase of emergency we require a day to get donors matching the patient blood group. This is time consuming and costly as well" stated PRO of a leading blood bank in Aurangabad. Strides Software Solutions, a pioneer in blood cycle management solution, has built up an emergency donor demand management feature on its platform www.dhealth.in to address this problem. Dhealth has a unique emergency donor demand management system which is integrated with a cloud based IVRS system having predefined response path. Dhealth, using a unique algorithm identifies the right set of donors and calls them on a click of a button. Dhealth is a capacity to call 400 donors per minute. The call includes an automated response system wherein if the donor is available to donate, he can update by pressing 1 and if not press 2. Dhealth has a multilingual calling facility. Thus for 200 donors, wherein earlier it would take 4-6 hrs, it now takes less than a minute. Moreover the conversion ratio is quite high with dhealth. With manual calling the conversion ratio was around 2-3% but with dhealth, the conversion ratio has been around 7-10%. "We are a healthcare company and call center is not our forte. It was tough for us to recruit, train and maintain the call center executives. It used to take lot of our time to conduct the call center activity. However, with dhealth we just need not pay any attention towards it. Just @ a click, we initiate a campaign and in the next minute, get the donors interested and accordingly align their blood donation schedule" stated Dr.Mundhada. The other unseen advantage of Emergency Donor demand management system has helped blood banks increase there in-house blood donation. In India almost 90% of the blood donations are at the camp site and just 10% within the blood banks. Inhouse blood donations have many advantages over blood donation at camp site. This includes safety for donors, high quality components and very cost effective. Dhealth helps blood banks to increase inhouse blood donations. “Addressing a critical pain point by innovative technology products is a testament to a company’s commitment to technology,” Mr.Ajeet Kunkulol , Chairman, SRS Indian red cross Blood Bank, Barshi. “With its high conversion ratio and ease to use, Strides has proven that it has the vision, determination and ability to adapt, innovate and come up with unique solutions in a fast changing environment."